Today I went in a toy shop to buy some presents and I stumbled across this very curious Spy Gear by Wild Planet Toy, among I others I noticed: The Spy tracker system: "Set up three secret spy trackers, draw a map on your control panel showing where each one is, and you will know where and when intruders (e.g., little sisters or parents) have entered the secured zone (...) Track movement up to 75 feet away. 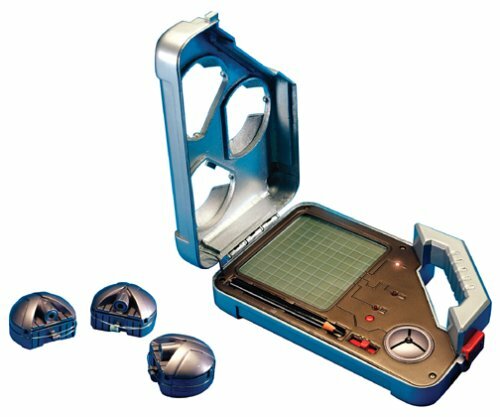 Includes cool tracking headquarters case with light-up display, audible warning signals and 3 remote motion sensors. Works indoors and out. ". Better than the follow-your-kids-with-a-GPS, it's a "be-tracked-by-your-kids". Note the vocabulary deployed: "you will know where and when intruders (e.g., little sisters or parents) have entered the secured zone " (well of course there is the spy rethoric). Now, things are reverse, there are location-based services for kids! There are also an eavesdropping device in the form of a pair of glasses or of a little car or as a pod. Besides, the night vision goggles looks cool. My favorite is definitely the Eye-Link Communicators: a headset display and arm-mounted keypad to transmit silent messages to other "agents".